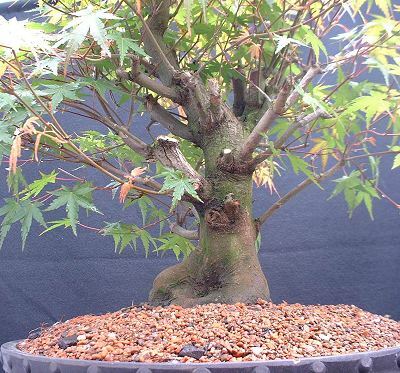 May 2005: I found this Acer palmatum bonsai on Ebay, it had quite a fat trunk but due to its ugliness, no-one seemed interested in bidding on it, so I decided to pick it up at a ridiculously low price of just £60. Above is the auction picture of the tree. 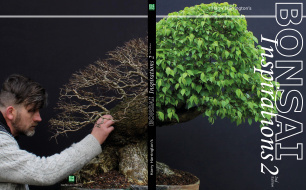 When I received the tree and studied it, I decided that the best front might be towards the left of the original front shown in the auction picture. As with many Korean imported trees, it was hopelessly root-bound though the soil was, thankfully, good. I lifted the tree out of its ceramic pot and potted it up into a larger mica pot straight away to allow some root growth for the remainder of 2005. June is a good time to prune heavy branches (that will leave large scars) on many deciduous trees as the resulting wound heals quickly. 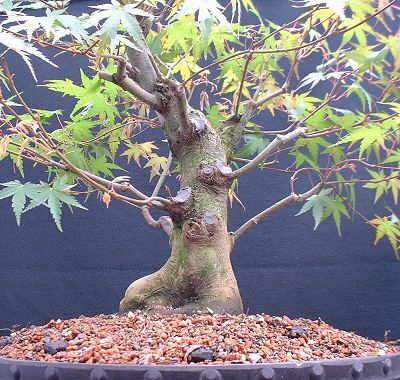 This bonsai had many heavy branches that were either too straight, had long internodes or were to thick to be bent with wire. Though it was not possible to consider the whole structure of the tree while still in leaf, I removed the heavy branches that I already knew had no future on this tree. After removal of over 1/2 of the branches and foliage, the tree didn't look pretty. Pruning out 'faulted' branches is not easy because the resulting branch structure can look very ugly (as shown above) but this is only short-term until new branches are grown. Very often, it is better to grit your teeth and correct the branch structure immediately and suffer the short-term consequences than to try and tolerate an ugly branch structure for many years!